Scams are schemes to con you out of your money. Find out about types of scam and how to spot and report scams. Look for signs to watch out for if you look after someone who could be vulnerable to scams. 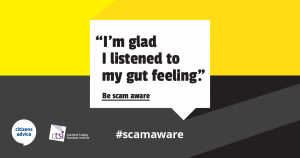 Throughout July we posted on our Twitter and Facebook pages information, tips and advice about various scams plus links to other organisations who can also help. 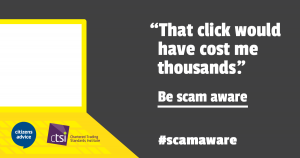 You can also report scams to Trading Standards by clicking here. To access our Twitter and Facebook pages please click on the icons on the right hand side of this page.